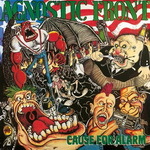 Strength Records in a few weeks will issue a re-release of the mighty Agnostic Front's 'Cause For Alarm' album on limited vinyl. The LP will be released in a limited edition of 500 copies on four different colors of wax! Stay tuned for more info on the release date and special pre-order packages. Check out more info here.